This week’s Catholic Schools Week theme is SHINE, Share His Incredible News Everywhere. 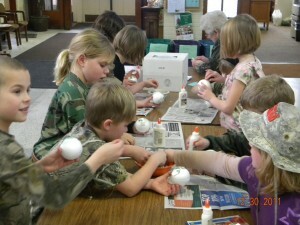 Each classroom decorated their door to the theme and students made mirror balls from crushed CD’s and styrofoam balls. 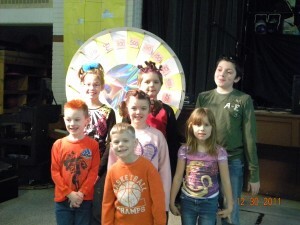 Monday was Camouflage Day at Sacred Heart Area School, where the students and staff had fun showing off their favorite greens and browns. It looked like we were ready for a duck hunt. The day was topped of with delicious root beer floats. Tuesday was Crazy Hair Day. There was a lot of creative hair-styling done in the morning. Thank you parents for all the laughs. We started the day off with a friendly game of Wheel of Fortune, and wrapped it up the with a “Drop Everything and Pray” event. All the students shared with us the person who taught them the most about their faith and then we prayed for all of them. 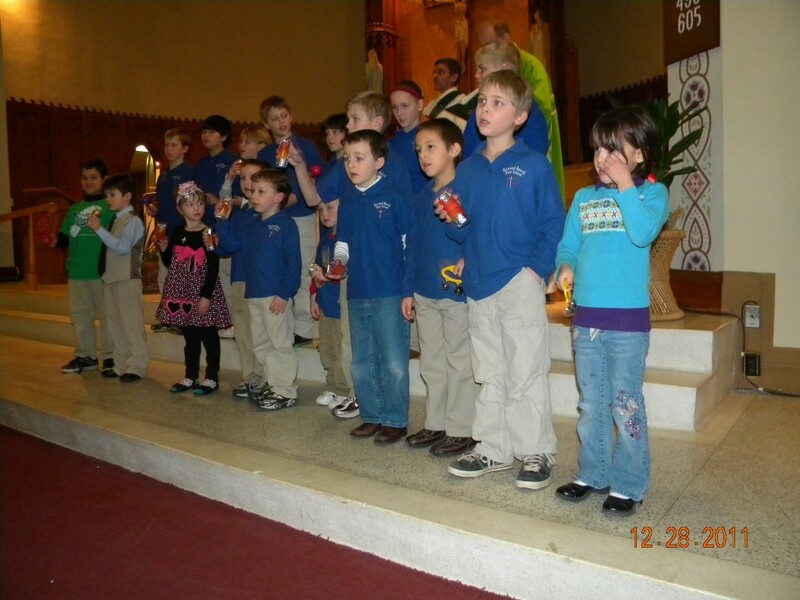 This past weekend the students of Sacred Heart Area School participated in the Catholic Schools Week Kick-off Mass at Sacred Heart on Saturday evening and Sunday morning at St. Michael’s, reading the liturgies, performing with song and instruments, and hosting fellowship meals after. This was a great opportunity for parishioners of our two parishes to see the seeds that have been planted by their school. This week Catholic Schools around the country will be celebrating what they are all about, which is family, faith, living, loving, and building the Kingdom of God hear on Earth. 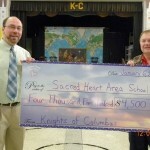 Keep checking sacredheartareaschool.org to see what we are up to throughout the week! Hello from the first graders! We are off to a great start in 2012! This week we read a story about two great friends, Frog and Toad. We learned about adjectives and “Bossy R”. We are becoming very good readers so please let us read to you at home! We are also working on writing friendly letters. Place value and numbers to 120 are the topics in Math. We have also been learning how to add double digit numbers! This week we wrap up our Social Studies until quarter 4. We are excited to get back into Science next week and will be discussing Earth science. In Religion, we read about Jesus and will be learning about the amazing things he did while he was on Earth. We are very excited for the upcoming Catholic Schools Week and hope to see you at the kick-off Masses on January 28th and 29th! 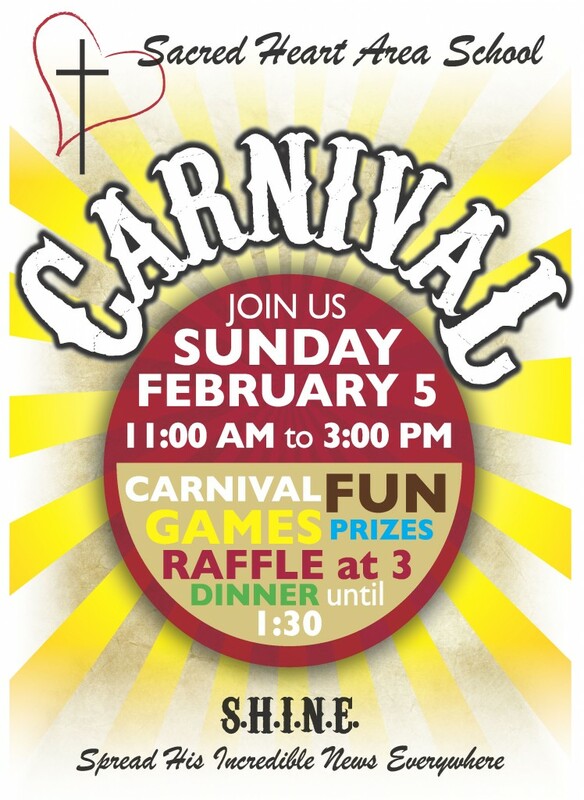 We hope you will join us on Sunday February 5th for tons of fun and games! See the flyer below. Sacred Heart Area School has a new website! It is attractive and easy to navigate, but most importantly, it is very easy for staff to create and make updates. This will make it a much better, more useful website for us all. Thanks again, Heather Erholtz, for creating it and training the staff to work with it! We also want to thank Linda Brotherton for several years of committed service to our previous website. Without your help we would have been lost. Last week the Total Board met to study the results of the most recent sixth grade survey and possible classroom arrangements in our upper grades. After a great deal of discussion, it was decided to call a special parent meeting, which will be held January 18th, at 7pm. It is highly recommended that all parents attend this meeting. We will discuss the potential for sixth grade and the dynamics of our current class sizes. This is an important opportunity for us to share insights and invite your comments on the future structure ofSacredHeartAreaSchool. Dan Hollenhorst, the Catholic school consultant for the diocese will also be present. Last night the Total Board met to study the results of the most recent sixth grade survey and possible classroom arrangements in our upper grades. After a great deal of discussion, it was decided to call a special parent meeting, which will be held January 18th, at 7pm. It is highly recommended that all parents attend this meeting which we will discuss the potential for sixth grade and the dynamics of our current class sizes. This is an important opportunity for us to share insights and invite your comments on the future structure of Sacred Heart Area School.